The Grizzly dynasty has grown to become one of Belgium's leading teams in the sprint competition in just four years' time, with the help of the two stock breeders 'Grizzly Wonder Breeder' and 'Blue Wonder Mother'. This team has won an impressive 36 first prizes with direct youngsters of this stock pair! The Grizzly dynasty of the successful sprint combination Vermeerbergen-Wilms-Mostmans is founded on the two stock parents BE13-6164780 Grizzly Wonder Breeder and his hen BE12-6188693 Blue Wonder Mother. And we were not at all surprised to find out that both birds have top class origins. Stock breeder Grizzly Wonder Breeder is a grandchild of the renowned 'Pitbull' of Karel Laenen - Van Reeth. 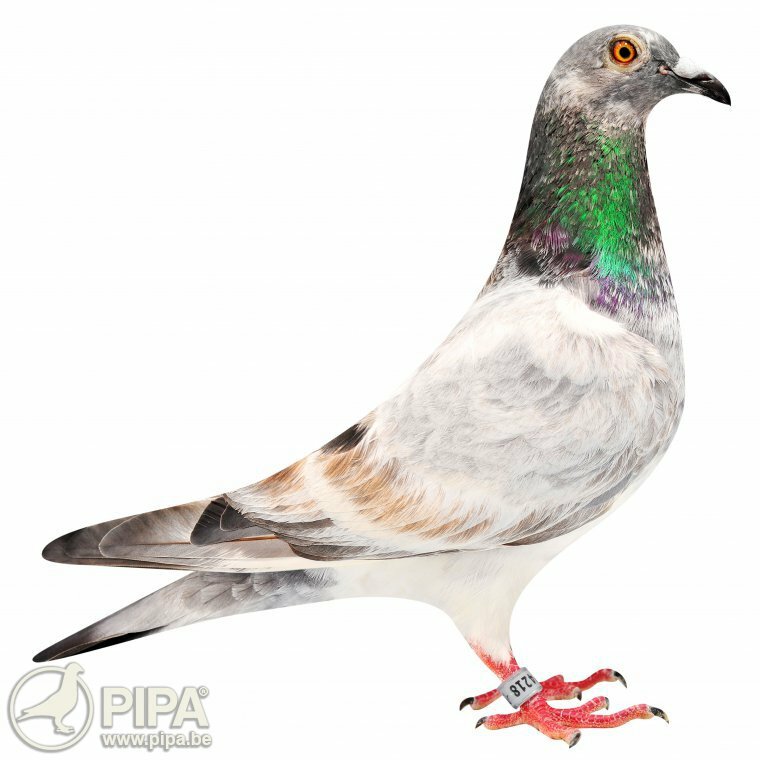 He was himself a great racing bird and a solid breeder: he is not only the stock breeder for Vermeerbergen-Wilms-Mostmans, he is also the great-grandfather of a 6th National Ace Pigeon KBDB 2010, a 2nd National Ace Pigeon Middle Distance KBDB 2013, 3rd National Ace Pigeon KBDB 2014, etc. 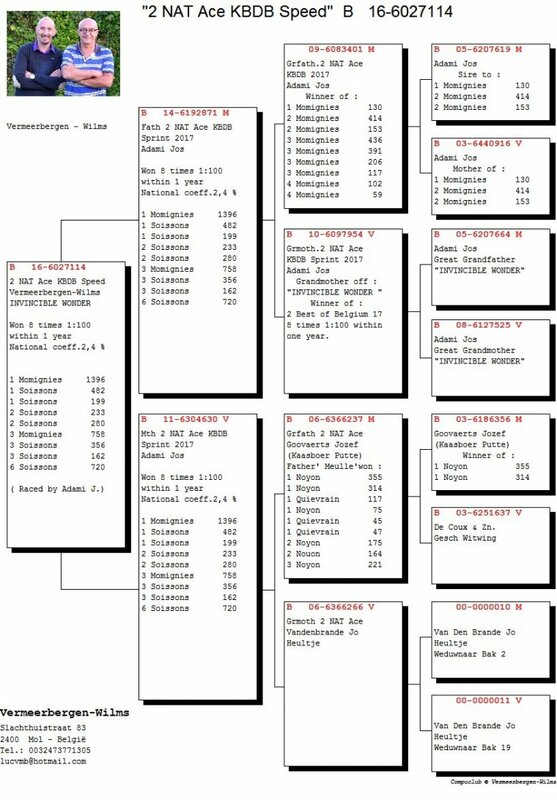 The fantastic pedigree of this stock breeder can be found here. The stock dam of 'Blue Wonder Mother' is a daughter of 'Grandson Olympic Lievin', a 100% Leo Heremans and himself the sire of 7 first prize winners, paired to Raketje. As her name suggests, she is a fabulous sprint bird with 6 first prizes to her name. Click here for the pedigree of this stock dam. Among the most famous and now most legendary youngsters of the Grizzly stock pair are BE15-6274218 Grizzly Ace Wonder, 2nd National Ace Pigeon Sprint KBDB 2017 and the winner of 7 first prizes, BE17-6200651 Sister Grizzly Ace Wonder, winner of 6 first prizes, and her nest sister BE17-6200652, winner of 5 first prizes. These last two youngsters of the stock pair, also called the Grizzly Sisters, were sensational in the 2018 sprint team, claiming 11 first prizes together! Like we said, an impressive 36 first prizes have been won with direct youngsters of this renowned pair since 2014, the year in which this pair was formed. They also win 60 prizes per 100, which is quite an achievement: keep in mind that the number of competing pigeons is not that high towards the end of the sprint competition. This means you have to be on top of your game to win a top 100 prize at all. 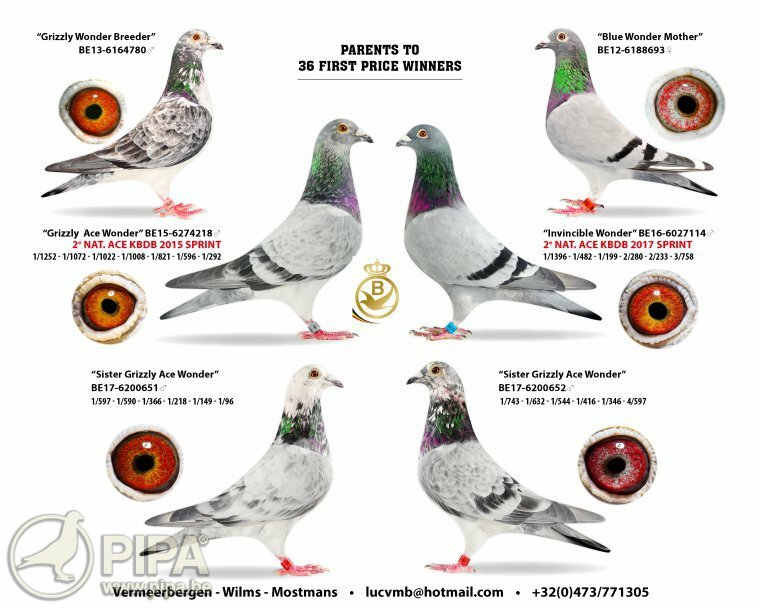 As you can see on this overview, there is one bird that seems out of place: BE16-6027114 Invincible Ace Wonder, 2nd National Ace Pigeon Sprint KBDB 2017 (bred and raced by J. Adami). 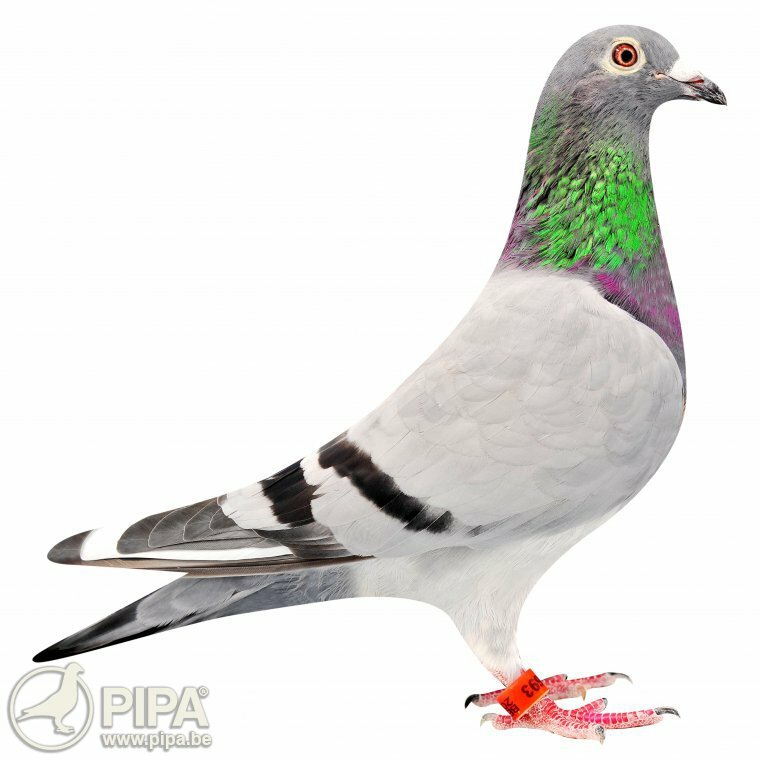 She is not related to the fantastic Grizzly dynasty but she does pack a punch as a sprint pigeon: she has 5 first prizes and 8 prizes per 100 to her name in a single season. Click here for her full pedigree. Among the results that deserve some extra attention in 2018 are the achievements of the two nest sisters BE17-6200651 and BE17-6200652. They were also included in this overview, based on their fabulous palmares for 2018. It is fair to say that, based on their list of achievements from 2018 and 2017, as young birds, the team's stock pair has yet again delivered two very talented birds. This fantastic looking hen has won 6 first prizes, 21 prizes per 20, as well as 26 prizes per 10. She claimed an impressive 38 prizes in two years' time (she doubled twice against the old birds in 2018). In 2018 she won a prize per 10 in 82% of her races, and a prize per 20 in 73%! 1/590, 1/597, 1/381, 1/225, 1/149, 1/96, 2/324, 2/314, 2/178, 4/743, 3/416, etc. Click here for a complete list of achievements. And this hen is proving to be a promising breeding bird as well: one of her sons has already claimed two first prizes from Quievrain as a young bird in 2018! This is the nest sister of the 651 and she appears to be just as fast. She currently has 33 prizes to her name (she doubled against old birds 5 in 2018). She has claimed 5 first prizes so far, and she took 11 top 10 prizes. Of her 33 prizes, 24 were won per ten (73%), and 58% were won per 20. 1/544, 1/743, 1/416, 1/346, 1/632, 4/597, 2/611, 4/324, 4/149, etc. Click here for her full palmares. 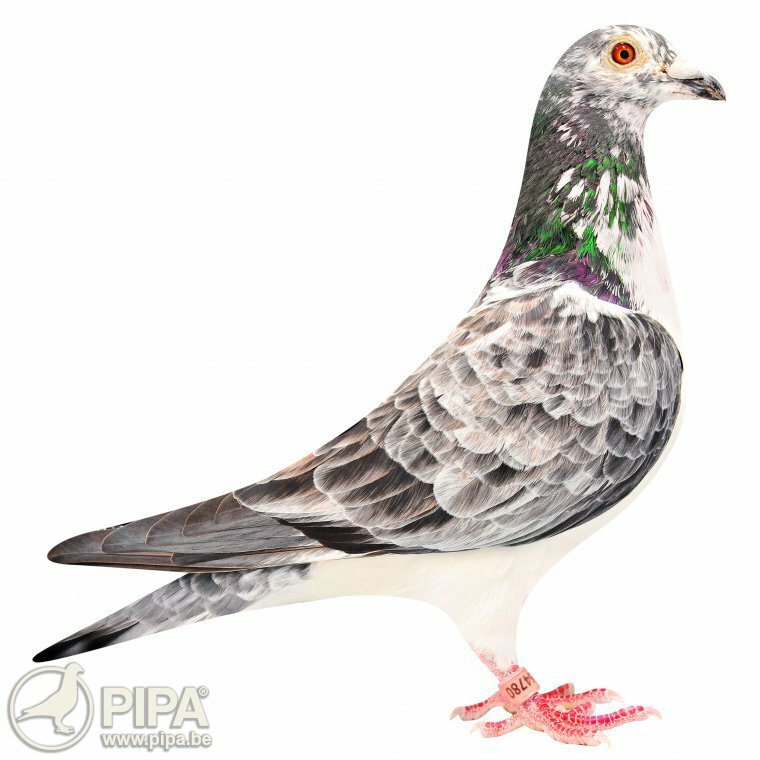 They claimed a third prize in pigeon union Sint-Jozef in Rijkevorsel in the 1+2 championship in all three categories. And they did claim a 1st ace pigeon in all three categories. The successful Vermeerbergen-Wilms-Mostmans combination has a bright future indeed. There is the super class pair that is still fairly young, and their descendants are proving to be highly promising as well. Needless to say, there is also a team of highly proficient fanciers, including most notably Kris Mostmans, who is responsible for the day to day running of the lofts in Rijkevorsel, and who can really push this team over the edge. We are confident that this breed will continue to deliver talented new birds, and that the Grizzly dynasty will continue to keep a firm grip on the sprint competition.